Hi everyone. In this tutorial we will learn how to load the model from an EMF file (Seemed easy but took me some searching to find how this is done, and I’m not sure I’m doing it the best way it could be done), and in the way we’ll also be expanding our model definition to match our requirements. If you didn’t generate your EMF editor code, please do so now, because we’ll be using it to bootstrap our EMF file before we open it using the GEF editor. So let’s get started. In the previous tutorial, we used a mock model hard-coded into our diagram, and we also gave the OPMObject figures random locations in our diagram. We’ll fix this in two steps, first by expanding the model’s definition and second by loading the model data from a file. 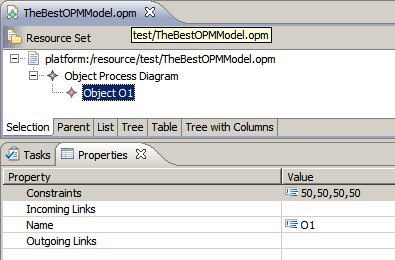 Now we will add constraints information to the OPMThing model class. 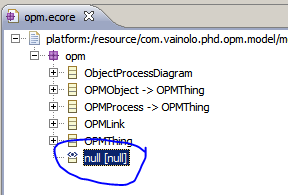 This requires three steps: first, we need to add the org.eclipse.draw2d plugin as a required dependency of the com.vainolo.phd.opm.model project to allow us to use the classes in this library in our model (an example how to add new dependencies is was shown in the 3rd tutorial). Second, we define a new EData Type, which is the way to connect Ecore models with existing data types outside the model. And third, the constraints attribute will be added to the OPMThing model class. As usual, the properties of this node are edited in the properties view of the eclipse framework, so if they are not already open double click on the new node to open the properties editor. 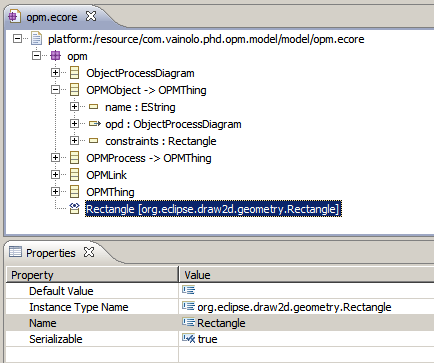 The data type we are defining is a connection to the Rectangle that is defined in org.eclipse.draw2d.geometry package, so we’ll name our new data type “Rectangle” and will set the “Instance Type Name” property to org.eclipse.draw2d.geometry.Rectangle. * <code>Rectangle</code> is represented as "x,y,width,heigth". Please save all of your work. I you want, you can check that the code generation does work as expected by re-generating the code and checking that the OPMFactoryImpl class still contains the code marked by @generated NOT. OPMPackage.eINSTANCE.eClass(); // This initializes the OPMPackage singleton implementation. // TODO do something smarter. After all this, your code should now compile with no errors. This is it. 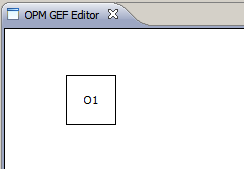 Right-click on your model file and select “Open With”->”OPM GEF Editor”. You should now see your object in the location you placed it. The final eclipse project files can be downloaded here. That’s all for today. If you have any problems, don’t hesitate to leave a comment. And thank you for your visit. your articles are really helpful. i am now facing a problem for extending an existing editor. i want the extension to be created in an eclipse fragment. what the minimum change should be done in the editor project? is it possible to just modify the models ecore file and create the view and editpart of the element in another fragment? Hi Simon. I am not sure I understand what you mean by “eclipse fragment”. Could you please give me a longer explanation? the fragment is another type of plugin. its configure file is fragment.xml. not plugin.xml. it a logical extension of its extended plugin. If you see the TIGER (model transformation) project source code. you can discover some example. But after a few days of studying. it seems not applicable. But its not the question for me now. I Lucian. From my experience the best way to learn is by reading code that works and does something similar to what you want to do, and then trying to learn why the code works. Since I am also learning GEF at this time, this is what I am doing. I plan on writing some more explanations on the internals of GEF but they are fairly complicated and not until I have full understanding of them I will be able to do this. Finally found a nice explanation on how GEF works. You can find it linked in my “useful links” page. Pretty useful but missing LOADS of examples. I’m trying to fill out that gap. i also think the mode persistence needs time studying. here is a piece of code for creating a model file. but the xmi file is encoded ascii, how to change it to utf-8? should i change some thing here? or should i change something during creating the resources? that’s not a problem either now. i have to set a encoding in the save options. Thanks you for your your tutorial, it is very interesting. But I can not have the OPM Model Editor, I have just the GEF Editor, I dont know what is missing. Can you tell me what the “Model Editor” depends on, what to to for having this Model Editor in the list choice editor ? What do you mean “with a real model”? The editor only works with OPM models. This is defined in the plug-in’s description, when it tells that only files ending with “.opm” are opened by the editor. In fact I’ve need to try for my company needs on a real models prototype of the company. I have some problems but it is ok know, thanks for your answer. I just want to say that I really appreciate these tutorials. Specially that you have attached the working code for each tutorial. This tutorial series in general does an excellent job of walking through the mechanics of GEF, but it does not follow some of the best practices for MVC, in particular separating model data from view data. In this specific installment of the tutorial, view-specific information (e.g. the rectangle data) is being put into the model. This makes it impossible, for example, to have multiple views of the same model element, as each would have different rectangle information. What you say regarding the view/model is more complicated. In my case, part of my model is the location of the figure. Furthermore, the really correct implementation would need two models, one for the view and one for the data. But this is too much work, and frankly not worth the effort. I’m suffer a problem that I don’t recognize if it’s an IDE bug or it’s my mistake. My eclipse Luna (4.40RC3) can’t find the IFileEditorInput. However, if I press the shortcout CTRL + SHIFT + T eclipse can open it. WTF? I’ve added correctly the new dependency to the manifest plus other possible dependencies (org.eclipse.ui, org.eclipse.ui.ide, etc.). And I’ve also tried to add directly the .jar as a project-dependency (in the build path) and always appears the mark of “cannot resolve”. I’ve googled also but I can’t find a solution that would be OK for me. Could you give me some idea about the problem? How could I resolve it? Hi Jose. This sometimes happened to me also, where dependencies that I know exist suddenly aren’t loaded. Sometimes restarting eclipse works. I you are using Maven, sometimes the problem is in the definitions there. Nothing of much help that I can say here. There is a problem parsing the model file you are using. This can be caused by changes I do all the time to the model. That’s the best I can help.